On Oct. 1, the much-anticipated United States Africa Command (Africom) was officially launched. This military reorganization of U.S. forces to oversee developments in the entire continent has been met with strong objection from the major political states and regional blocs there. Despite a 19-month effort to win African acceptance for this plan, the headquarters of Africom remains in Stuttgart, Germany. Although the West African state of Liberia has expressed interest in hosting Africom, the only real base of U.S. operations is Camp Lemonier in Djibouti in the Horn of Africa. Liberia has maintained close ties with the U.S. since its inception as a semi-colonial outpost where former slaves sought an independent existence during the early and middle 19th century. In 1926, the Firestone Co. acquired control of 1 million acres of Liberia and soon had turned the country into the world’s largest rubber plantation. The U.S. military base in Djibouti has existed since at least 2002, when the Bush administration began to place greater emphasis on the Horn of Africa, claiming that so-called “Islamic terrorists” were utilizing neighboring Somalia as an area of operation. Reports have also surfaced since 2007 that the Southern African nation of Botswana was being courted over the possibility of establishing an Africom base in this largely arid and sparsely populated diamond-rich country, which borders both Zimbabwe and South Africa (Kenya Daily Nation, Sept. 13, 2007). Prior to the creation of Africom, the U.S. military command structure in Africa was divided among three other regions: the Central Command (Centcom), which was responsible for Egypt, Sudan, Eritrea, Ethiopia, Djibouti, Somalia and Kenya; the European Command (Eucom), which covered other states on the continent; and the Pacific Command (Pacom), with responsibility for Madagascar, the Seychelles and the Indian Ocean area. 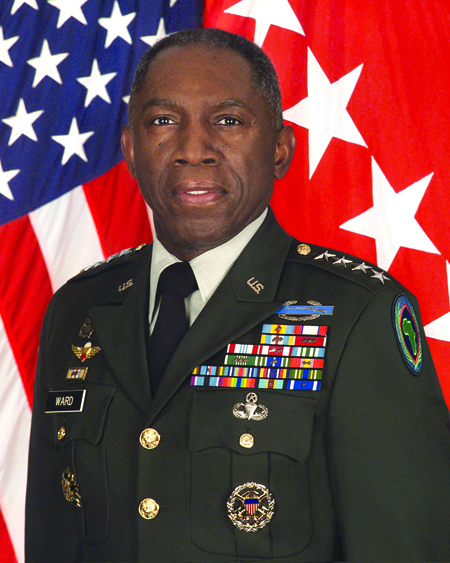 Africom will be headed by a four-star general, William E. Ward, who is African-American. When the Bush administration first announced in February 2007 that it would launch this new reorganization plan, the nations of South Africa, Nigeria, Zimbabwe and others immediately denounced the concept and urged other states to follow suit. Since this time period, the U.S. has attempted to cover up its true imperialist objectives and to promote Africom as another assistance program that would enhance the continent’s ability in various areas, including national security, technical development and governmental capacity building. In a recent State Department-sponsored Voice of America radio interview, Mauro De Lorenzo, a resident fellow for foreign and defense policy at the right-wing American Enterprise Institute, told reporter Peter Clottey from Washington that Africom would bolster Africa’s security situation but played down its impact. “I think it’s a positive development, but one which almost no one will notice in Africa in their daily lives. Africom is simply going to take over the programs and objectives that were previously carried out by three separate U.S military commands,” said the AEI spokesperson. However, an article published on the British Broadcasting Corporation (BBC) website on Oct.1 indicated that the number one priority of Africom was the so-called “war on terrorism.” The U.S. has no faith in those states it has funded to work toward eradicating the purported influence of al-Qaeda and other organizations that are targeted as a threat to imperialist interests. According to the BBC article, the second priority of Africom is to secure oil resources for U.S. markets. With the increasing levels of resistance in Iraq and throughout the Middle East region, the transnational oil corporations are looking to Africa to supply greater amounts of petroleum to the U.S. and other Western imperialist countries. “Africa is the world’s primary growing oil market; the U.S. already gets about 20 percent of its oil supplies from West Africa and the U.S. is committed to increasing its supply of oil from the continent to 25 percent by 2015,” the BBC article stated. There was also concern expressed by the BBC that the political situations in Sudan, Nigeria, Angola and Equatorial Guinea, all oil-rich states, were not necessary conducive to U.S. strategic interests. Finally, the BBC identified the necessity, as far as U.S. imperialism is concerned, to counteract the emerging influence of the People’s Republic of China on the African continent. China not only has developed economic partnerships with numerous African countries but has intervened at the United Nations Security Council to prevent further sanctions against Zimbabwe and Sudan, two states that have been targeted by the U.S. for regime change. “China has prospered in Africa, leaving the rest of the world – particularly Western countries – behind. Africom represents part of a new U.S. strategy to engage with Africa,” the article continued. With the formal launching of Africom, it is essential that people within the U.S. oppose this effort on the part of imperialism to further its economic and military grip over large sections of the African continent. It is clear that several areas of the continent have been selected for direct military intervention to enhance U.S. control over oil and other strategic resources that are key to the continued dominance of capitalist globalization. Recent diplomatic and military efforts against the nations of Somalia, Sudan and Zimbabwe must be analyzed in light of the formation of Africom. These countries have sought to move in a political direction independent of U.S. influence. The corporate media outlets within the imperialist states have continually slandered the leading political forces within these areas and are constantly attempting to influence public opinion towards accepting direct military intervention. Consequently, anti-war and anti-imperialist groups in the capitalist states must oppose Africom and its military interventionist program for the African continent. The potential for wider military conflicts on the African continent involving direct and indirect U.S. involvement is all too real. In Somalia, a U.S.-backed invasion by Ethiopian troops in December 2006 has created the worst humanitarian crisis on the continent. In Zimbabwe, the U.S., along with Britain and the European Union, has imposed sanctions that have had a devastating impact on this Southern African nation’s economy. In Sudan, the conflict in Darfur has been utilized to push for the arrest of that nation’s head of state and for U.S. intervention through a purported U.N. peacekeeping force. Therefore, U.S. military involvement in Africa can mean only greater instability and underdevelopment on the continent. Abayomi Azikiwe is editor of the Pan-African News Wire. He was an organizer of the U.S. Imperialism & Africa conference sponsored by MECAWI in Detroit on Feb. 23. The conference condemned Africom and called for the peoples of Africa to reject its aims and objectives. © 2008 Workers World. This story was originally published Oct. 9, 2008, by Workers World, 55 W. 17th St., New York NY 10011, ww@workers.org, www.workers.org, at www.workers.org/2008/world/africom_1016/.